Demonstration of tameshi giri by Takeshi Mochizuki and explanations on jutsu and Iai Batto Jutsu. Created by Raifu HIBINO (1864 - 1926), born in the Satsuma Domain (prefecture of Kagoshima nowadays). At the age of 4, he moves to Edo (Tokyo) with his father. He earns money by doing kenjutsu fights and kata demonstrations. He creates his school in 1890. 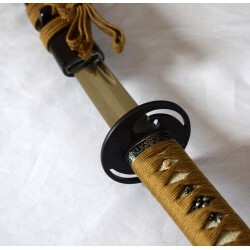 It is rational and its techniques are fundamentals of Battojutsu and Iaijutsu. Takeshi MOCHIZUKI is the successor of Shinto ryu iaijutsu and Asayama ichiden ryu kusarigama jutsu. He has a 6th dan from Kodachi jutsu and Tozan ryu batto jutsu, as well as a 7th dan from Nakamura ryu battodo. 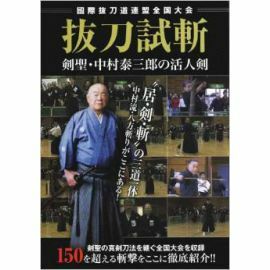 He won the Japanese Championship of Iai Battojutsu, Tameshigiri (Saber Cup Test) and Battojutsu on numerous occasions. He is one of the best Iai Battodo Ka in history. 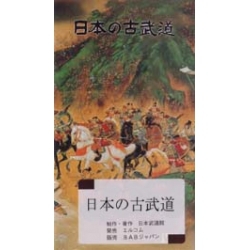 The content of this DVD " Shinto ryu Iaibatto jutsu-MOCHIZUKI Takeshi "
-Sanpo ( saho ) etc….